Definition at line 78 of file llfloaterreporter.h. Definition at line 108 of file llfloaterreporter.cpp. References LLMessageSystem::addUUID(), BUG_REPORT, LLUICtrlFactory::buildFloater(), LLPanel::childGetText(), LLPanel::childSetAction(), LLPanel::childSetFocus(), LLPanel::childSetText(), enableControls(), FALSE, gAgent, gDialogVisible, LLUICtrlFactory::getButtonByName(), LLPanel::getCtrlByNameAndType(), LLAgent::getID(), LLViewerRegion::getName(), LLViewerRegion::getOriginGlobal(), LLAgent::getPositionGlobal(), LLAgent::getRegion(), LLAgent::getSessionID(), gMessageSystem, gReporterInstances, gUICtrlFactory, mDefaultSummary, LLMessageSystem::newMessage(), LLMessageSystem::nextBlock(), LLStringBase< char >::null, onClickCancel(), onClickObjPicker(), onClickSelectAbuser(), onClickSend(), LLAgent::sendReliableMessage(), LLLineEditor::setEnabled(), setPosBox(), LLFloater::setVisible(), takeScreenshot(), TRUE, and WIDGET_TYPE_LINE_EDITOR. Referenced by createNewAbuseReporter(), and createNewBugReporter(). Definition at line 222 of file llfloaterreporter.cpp. References closePickTool(), f, FALSE, gDialogVisible, gReporterInstances, mMCDList, mObjectID, mPicking, mPosition, mReportType, mResourceDatap, LLUUID::null, and LLVector3::setVec(). Definition at line 1015 of file llfloaterreporter.cpp. References COMPLAINT_REPORT, LLUICtrlFactory::getTextEditorByName(), gReporterInstances, and LLTextEditor::insertText(). Definition at line 364 of file llfloaterreporter.cpp. Definition at line 472 of file llfloaterreporter.cpp. References LLToolMgr::clearTransientTool(), FALSE, LLUICtrlFactory::getButtonByName(), LLToolObjPicker::getObjectID(), gToolMgr, gToolObjPicker, and LLButton::setToggleState(). Referenced by onClickCancel(), onClickObjPicker(), onClickSend(), and ~LLFloaterReporter(). Definition at line 574 of file llfloaterreporter.cpp. Referenced by showFromMenu(), and showFromObject(). Definition at line 583 of file llfloaterreporter.cpp. Definition at line 243 of file llfloaterreporter.cpp. References BUG_REPORT, LLPanel::childSetEnabled(), LLPanel::childSetValue(), LLFloater::draw(), FALSE, gEmailToEstateOwner, mReportType, and TRUE. Definition at line 261 of file llfloaterreporter.cpp. References BUG_REPORT, LLPanel::childDisable(), LLPanel::childSetEnabled(), and mReportType. Definition at line 663 of file llfloaterreporter.cpp. References LLSD::asString(), BUG_REPORT, LLPanel::childGetText(), LLPanel::childGetValue(), LLSD::emptyMap(), FALSE, gAgent, gEmailToEstateOwner, LLUICtrlFactory::getComboBoxByName(), LLCPUInfo::getFamily(), LLViewerRegion::getName(), LLAgent::getRegion(), LLComboBox::getSimpleSelectedItem(), LLVector3::getValue(), gGLManager, gInProductionGrid, gSysCPU, LL_VERSION_MAJOR, LL_VERSION_MINOR, LL_VERSION_PATCH, LL_VERSION_REVISION, LL_VIEWER_BUILD, mAbuserID, MAX_STRING, mCopyrightWarningSeen, LLGLManager::mDriverVersionVendorString, LLGLManager::mGLRenderer, mObjectID, mPosition, mReportType, and LLUUID::null. Definition at line 278 of file llfloaterreporter.cpp. References _PREHASH_AgentData, _PREHASH_AgentID, _PREHASH_ObjectData, _PREHASH_ObjectID, _PREHASH_RequestFlags, _PREHASH_RequestObjectPropertiesFamily, _PREHASH_SessionID, LLMessageSystem::addU32Fast(), LLMessageSystem::addUUIDFast(), BUG_REPORT, BUG_REPORT_REQUEST, LLPanel::childSetText(), COMPLAINT_REPORT_REQUEST, LLViewerObjectList::findObject(), gAgent, LLViewerRegion::getHost(), LLAgent::getID(), LLViewerRegion::getName(), LLViewerObject::getNVPair(), LLViewerObject::getPositionRegion(), LLViewerObject::getRegion(), LLXform::getRoot(), LLAgent::getSessionID(), LLNameValue::getString(), gMessageSystem, gObjectList, LLViewerObject::isAttachment(), LLPrimitive::isAvatar(), mAbuserID, mObjectID, mReportType, LLMessageSystem::newMessageFast(), LLMessageSystem::nextBlockFast(), NULL, LLUUID::null, LLMessageSystem::sendReliable(), and setPosBox(). Definition at line 563 of file llfloaterreporter.cpp. Referenced by LLSelectMgr::processObjectPropertiesFamily(), and uploadDoneCallback(). Definition at line 442 of file llfloaterreporter.cpp. Definition at line 458 of file llfloaterreporter.cpp. References closePickTool(), LLUICtrlFactory::getButtonByName(), gToolMgr, gToolObjPicker, LLStringBase< char >::null, LLToolObjPicker::setExitCallback(), LLButton::setToggleState(), LLToolMgr::setTransientTool(), and TRUE. Definition at line 356 of file llfloaterreporter.cpp. References LLFloater::addDependentFloater(), callbackAvatarID(), FALSE, LLFloaterView::getParentFloater(), gFloaterView, LLFloaterAvatarPicker::show(), and TRUE. Definition at line 382 of file llfloaterreporter.cpp. References LLViewerWindow::alertXml(), BUG_REPORT, closePickTool(), gAgent, LLViewerRegion::getCapability(), LLAgent::getRegion(), gViewerWindow, LLUploadDialog::modalUploadDialog(), LLUploadDialog::modalUploadFinished(), LLStringBase< char >::toLower(), and TRUE. Definition at line 204 of file llfloaterreporter.cpp. References LLViewerWindow::alertXml(), gDialogVisible, gEmailToEstateOwner, LLMessageSystem::getU32(), gViewerWindow, and REGION_FLAGS_ABUSE_EMAIL_TO_ESTATE_OWNER. Definition at line 856 of file llfloaterreporter.cpp. References LLPanel::childGetValue(), LLResourceData::mAssetInfo, mResourceDatap, LLAssetInfo::mType, LLAssetInfo::mUuid, and LLHTTPClient::post(). Definition at line 790 of file llfloaterreporter.cpp. References _PREHASH_AgentData, _PREHASH_AgentID, _PREHASH_Category, _PREHASH_CheckFlags, _PREHASH_Details, _PREHASH_ObjectID, _PREHASH_Position, _PREHASH_ReportData, _PREHASH_ReportType, _PREHASH_ScreenshotID, _PREHASH_SessionID, _PREHASH_Summary, _PREHASH_UserReport, LLMessageSystem::addString(), LLMessageSystem::addStringFast(), LLMessageSystem::addU8(), LLMessageSystem::addU8Fast(), LLMessageSystem::addUUID(), LLMessageSystem::addUUIDFast(), LLMessageSystem::addVector3Fast(), gAgent, LLViewerRegion::getHost(), LLAgent::getID(), LLAgent::getRegion(), LLAgent::getSessionID(), gMessageSystem, LLMessageSystem::newMessageFast(), LLMessageSystem::nextBlockFast(), and LLMessageSystem::sendReliable(). Definition at line 999 of file llfloaterreporter.cpp. Definition at line 593 of file llfloaterreporter.cpp. Definition at line 989 of file llfloaterreporter.cpp. 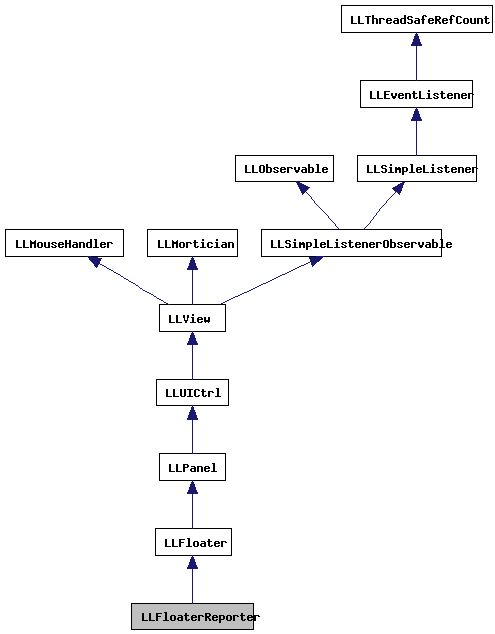 References LLPanel::childSetText(), llformat(), mPosition, LLVector3::mV, LLVector3::setVec(), VX, VY, and VZ. Referenced by getObjectInfo(), and LLFloaterReporter(). Definition at line 487 of file llfloaterreporter.cpp. References LLViewerWindow::alertXml(), BUG_REPORT, LLAgent::buildFullname(), COMPLAINT_REPORT, createNewAbuseReporter(), createNewBugReporter(), f, gAgent, gReporterInstances, gViewerWindow, llendl, and llwarns. Definition at line 532 of file llfloaterreporter.cpp. References LLAgent::buildFullname(), createNewAbuseReporter(), f, FALSE, gAgent, gDialogVisible, and TRUE. Referenced by LLObjectReportAbuse::handleEvent(), and LLFloaterAvatarList::processARQueue(). Definition at line 872 of file llfloaterreporter.cpp. References LLViewerImageList::addImage(), LLAssetType::AT_TEXTURE, BUG_REPORT, COMPLAINT_REPORT, LLViewerImageList::convertToUploadFile(), FALSE, gAgent, gAgentID, LLUUID::generate(), LLAgent::getSecureSessionID(), LLUICtrlFactory::getTexturePickerByName(), gImageList, gVFS, gViewerWindow, LLInventoryType::IT_NONE, llendl, LLTexturePicker, llwarns, LLTransactionID::makeAssetID(), LLResourceData::mAssetInfo, LLAssetInfo::mCreatorID, LLResourceData::mInventoryType, LLResourceData::mPreferredLocation, mReportType, mResourceDatap, LLAssetInfo::mTransactionID, LLAssetInfo::mType, LLAssetInfo::mUuid, LLViewerWindow::rawSnapshot(), S32, LLAssetInfo::setDescription(), LLAssetInfo::setName(), texture, TRUE, and LLVFile::writeFile(). Definition at line 946 of file llfloaterreporter.cpp. References LLViewerWindow::alertXml(), BUG_REPORT, COMPLAINT_REPORT, LLAssetStorage::getErrorString(), getReporter(), gViewerWindow, llendl, llinfos, llwarns, LLUploadDialog::modalUploadFinished(), LLResourceData::mPreferredLocation, and UNKNOWN_REPORT. Definition at line 930 of file llfloaterreporter.cpp. References gAssetStorage, LLAssetInfo::getDescription(), LLAssetInfo::getName(), llendl, llinfos, LLAssetType::lookup(), LLResourceData::mAssetInfo, mResourceDatap, LLAssetInfo::mTransactionID, LLAssetInfo::mType, LLAssetInfo::mUuid, LLAssetStorage::storeAssetData(), TRUE, and uploadDoneCallback(). Definition at line 602 of file llfloaterreporter.cpp. References LLViewerWindow::alertXml(), LLSD::asInteger(), BUG_REPORT, LLPanel::childGetText(), LLPanel::childGetValue(), gViewerWindow, mDefaultSummary, and mReportType. Definition at line 132 of file llfloaterreporter.h. Referenced by gatherReport(), getObjectInfo(), and setPickedObjectProperties(). Definition at line 136 of file llfloaterreporter.h. Definition at line 138 of file llfloaterreporter.h. Referenced by LLFloaterReporter(), and validateReport(). Definition at line 133 of file llfloaterreporter.h. Definition at line 137 of file llfloaterreporter.h. Definition at line 130 of file llfloaterreporter.h. Referenced by gatherReport(), getObjectInfo(), and ~LLFloaterReporter(). Definition at line 134 of file llfloaterreporter.h. Definition at line 135 of file llfloaterreporter.h. Referenced by gatherReport(), setPosBox(), and ~LLFloaterReporter(). Definition at line 129 of file llfloaterreporter.h. Referenced by draw(), enableControls(), gatherReport(), getObjectInfo(), takeScreenshot(), validateReport(), and ~LLFloaterReporter(). Definition at line 139 of file llfloaterreporter.h. Referenced by sendReportViaCaps(), takeScreenshot(), uploadImage(), and ~LLFloaterReporter(). Definition at line 131 of file llfloaterreporter.h.